Grace Potter is FIRE! Check out the latest video for new single "Paris (Ooh La La)," off of their self titled album Grace Potter & The Nocturnals. Unbelievable. I can only imagine how good these guys are live. Grace Potter kind of reminds me of a more ROCK & ROLL version of British soul singer Duffy. This Vermont-based band blends old fashioned rock & roll with blues, soul and R&B. It doesn't hurt that front woman Potter is absolutely STUNNING. The black and white video for "Paris" was directed by Paul Minor. The amazingly talented UK singer/songwriter Ellie Goulding performed a FANTASTIC set at the iTunes Festival at the Roundhouse in London earlier this month. The performance (ALL OF IT) is now available to watch online! Definitely worth a look/listen, especially if you haven't seen footage of Goulding performing live before. 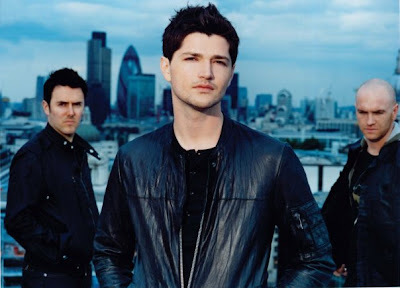 Yesterday, Irish Rockers The Script unveiled their new single "For The First Time," from their upcoming second LP entitled Science + Faith. The Single comes out in the UK on September 5th, followed by the album's release on September 13th. MAN - it's so hard to believe that their self titled album was first released in Europe in 2008! The boys JUST exploded here in the U.S., where their single "Breakeven" peaked at #12 on the Billboard Hot 100 and their album peaked at #64 on the Billboard 200. I can't imagine HOW ready these guys are to start doing some new material on stage. "For The First Time" is a safe first single. Maybe too safe. It sounds a bit too much like anything else the boys have ever released, only not as good. I feel like with "Breakeven," "The Man Who Can't Be Moved" and "Before The Worst," there was at least something going on, melodically. Something interesting. Something different. Something pleasing to the ear. Of course there's a melody here and it's perfectly pleasant but it's nothing that sets the song apart from any other pop/rock song on the radio. I'd almost rather listen to Train. Come on boys! Give us something different! Listen to the song and tell me what you think! How the HELL did I miss this news? Robyn on Letterman? Oh well. Someone uploaded it so THANK GOD for that. The pint-sized popstar from Sweden stopped by Letterman on July 19th and performed her Body Talk Pt. 1 single, "Dancing On My Own." I love this. I love her. I love that Robyn can take a sad song and make it happy. Sure, it's partially the pulsating synths but it's also Robyn's energy. Seeing her get into the song is priceless. She's really got great stage presence and I remember that from her show at the Paradise last year. Brilliant. I'm BEYOND ecstatic to see her live with Kelis next week at the House of Blues for the All Hearts Tour. It's going to be QUITE the show. Currently, "Dancing On My Own" is currently #3 on the Billboard Hot Dance Club Play chart. Her next single, "Hang With Me" comes out in September.